Like many athletes who use a racquet, bat or club, tennis players sustain a significant number of injuries to the wrist. An understanding of the common injuries that occur, their clinical presentation and an approach to management can greatly facilitate the care of these individuals and maximise their ability to compete. Wrist injuries can be classified as radial-sided and ulnar-sided. A study by Tagliafico et al examined 370 non-professional tennis players and found that radial-sided wrist injuries occurred most often in players who utilised an Eastern grip. Ulnar-sided wrist injuries were more frequently associated with Western or Semi-Western grips1. Some common radial-sided wrist injuries include scaphoid fractures and dorsal carpal ganglion cyst. On the ulnar side of the wrist the most common injuries involve the extensor carpi ulnaris tendon or the triangular fibrocartilage complex (stabiliser of the distal radioulnar joint). Also encountered in this population are fractures of the hook of the hamate. A consistent approach to the examination of the wrist is mandatory to achieve reproducible results. The structures of the wrist are very small, but discrimination of pathology in areas less than 1 cm apart is possible with a careful physical examination. It is critical to understand the mobile nature of the anatomic structures in the wrist and their variations in different positions of wrist flexion, extension, radial and ulnar deviation as well as forearm rotation. The patient’s elbow is placed upon the table and the arm is placed in neutral rotation with the wrist in a neutral position with the fingers pointing towards the ceiling. In this manner the point of maximal tenderness is palpated. This is key to making a diagnosis and provocative manoeuvres are performed as needed based upon the point of maximal tenderness to define the pathology2. Though not exclusive to racquet sports by any means, scaphoid fracture can present in a very subtle manner. To miss the diagnosis is to greatly decrease the likelihood of satisfactory healing which warrants its inclusion here. Typical history is a fall on the outstretched hand, with acute pain on the radial aspect of the wrist. A physical examination is important as it is not uncommon for the elite athlete not to recognise the severity of the injury, delaying diagnosis further. 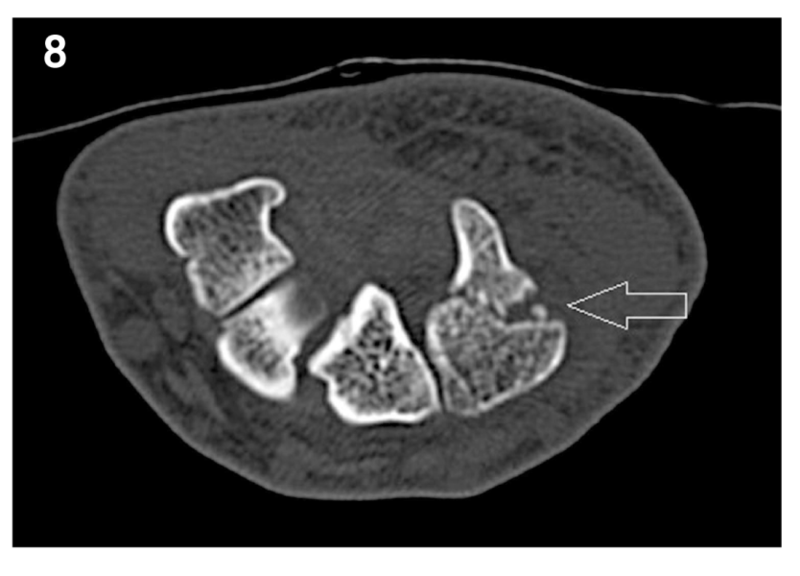 Examination may be fairly benign, however point tenderness in the anatomic snuffbox or an effusion (Figure 1 arrow) indicate high suspicion for scaphoid fracture even with negative X-rays. Plain X-rays can often diagnose scaphoid fractures. In cases where the diagnosis is in doubt, MRI has a 96% sensitivity and 99% specificity for the diagnosis3. Ultrasound is increasingly being used in the examination of the wrist in general and to diagnose non-displaced scaphoid fractures specifically. Displaced scaphoid fractures are treated operatively with anatomic reduction and internal fixation. Non-displaced scaphoid fractures can be treated with cast immobilisation or in some cases with percutaneous fixation to allow early motion. Neither method has been demonstrated to be superior in the case of non-displaced scaphoid fractures and individual factors help the surgeon and athlete decide which is most appropriate4,5. A common diagnosis in the general population can have an unusual presentation in the tennis player. A ganglion cyst is essentially a hernia of joint fluid into the soft tissues. 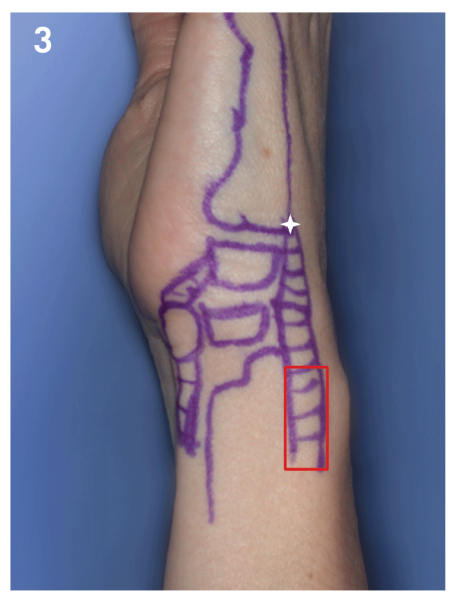 It occurs in characteristic locations in the wrist – typically centred over the scapholunate joint (Figure 2). The initial development is often idiopathic but once it forms, it can create pressure on surrounding nerves or cause impingement between the carpal bones and the radius during extreme extension, causing pain. 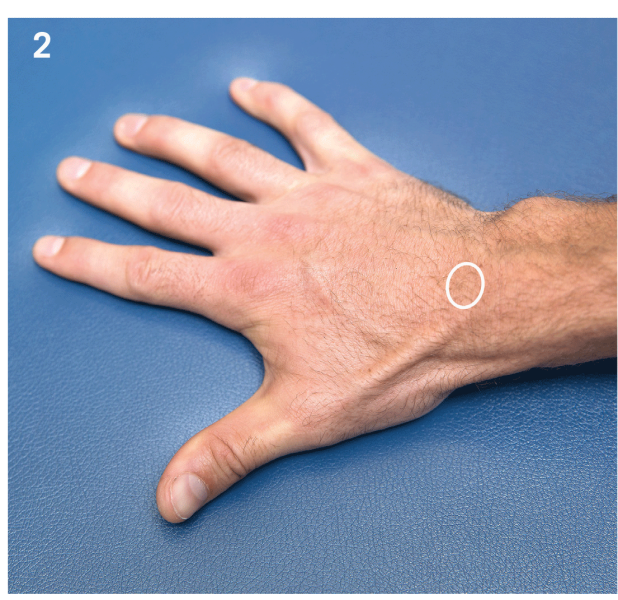 The player will often note generalised dorsal wrist pain, which is more radial than ulnar but may have difficulty describing the location. There may or may not be a focal palpable mass. In the absence of a mass but with characteristic symptoms it is termed ‘occult ganglion cyst’ and treated in the same way. Pain is worse with extension of the wrist, as in doing a push up, pushing open doors or the cocking motion. There also tends to be pain with impact with the ball during forehand swing or serve. 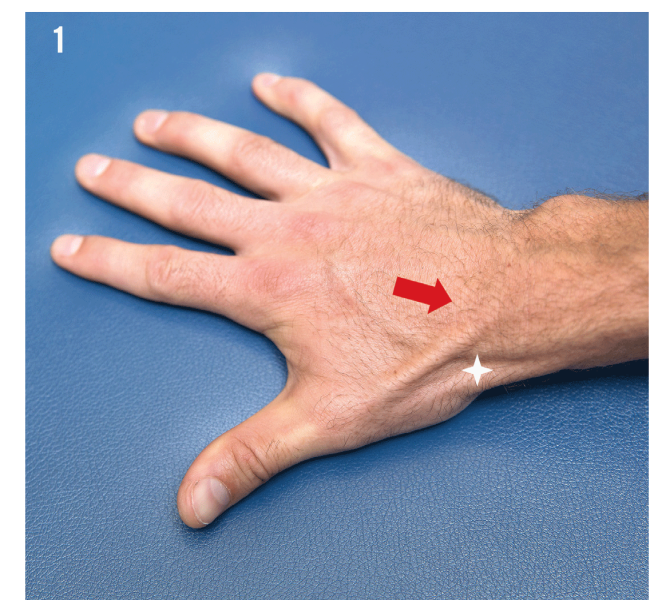 There is focal point tenderness over the scapholunate joint. Wrist extension often exacerbates or reproduces the pain. Watson’s test, a manoeuvre that directs pressure on the flexed distal scaphoid pole as the wrist is brought from radial deviation into ulnar deviation, is negative. This manoeuvre is more commonly positive (painful scaphoid subluxation and reduction) in patients with scapholunate ligament injuries. A palpable mass may be evident, which transilluminates. Though the diagnosis can be made without other studies, plain X-rays help ensure that there is no obvious scapholunate injury. MRI and ultrasound can also demonstrate a cyst and are helpful in cases where a cyst cannot be palpated. Activity cessation for 2 to 3 weeks and wrist splinting may be helpful in treating ganglion cyst and the pain associated with it. Occasionally corticosteroid injections or aspiration can be used to temporarily decrease the inflammation and pain. Surgical excision has the lowest recurrence rate for ganglion cyst and can be done arthroscopically or open procedure6. A very common injury to the ulnar side of the wrist is tear or instability of the extensor carpi ulnaris (ECU) tendon. This tendon is unique in that it is fixed to the ulna by a thick retinacular sheath, but its insertion at the base of the fifth metacarpal rotates around the fixed ulna with the radius (Figure 3). This creates a pulley that sees significant stress with forearm rotation. In extreme extension and ulnar deviation, as in the case of the non-dominant hand in the two-handed backhand or the dominant hand in the forehand, this stress can lead to injury to the tendon or its sub-sheath, as noted by Montalvan et al7. The sudden onset of ulnar-sided wrist pain during a two-handed backhand or forehand stroke is the typical history. In an oft cited series of these injuries, pain with passive supination, tenderness over the ECU tendon at the sub-sheath as well as localised swelling are the most common findings. Subluxation of the ECU tendon (snapping with forearm rotation) may be present but is highly variable7. MRI and ultrasound can diagnose rupture of the ECU sheath, most obvious on axial images (Figure 4). Both prolonged immobilisation and operative fixation have been described to treat this injury. Operative treatment may include anatomic reconstruction of the ECU tendon sheath or tendon graft or flap reconstruction8,9. The primary soft tissue stabiliser of the distal radioulnar joint is the triangular fibrocartilage. 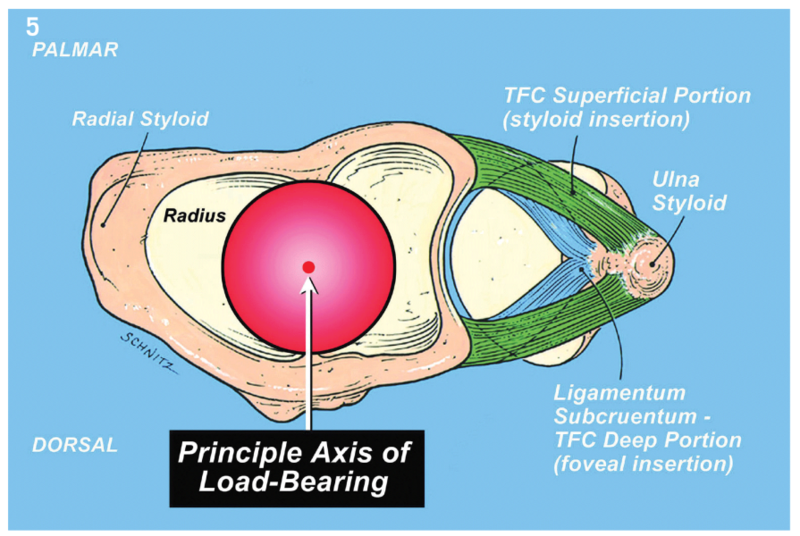 Comprised of a meniscus-like disc firmly attached to the dorsal and palmar radioulnar ligaments, the triangular fibrocartilage complex (TFC) provides the stability to maintain the relationship of the ulnar head in the sigmoid notch of the radius (Figure 5). The predominant mechanism of injury in tennis players is the sudden reversal of momentum of the radius upon ball contact while the fixed ulna continues to travel in the direction of the swing. It occurs in the dominant wrist in the forehand and the non-dominant wrist in the two-handed backhand. The athlete will typically present with acute ulnar-sided wrist pain. The pain is localised just distal to the ulna styloid at the ‘fovea’ (Figure 6). The pain is often worse with rotation of the wrist and there may be a clicking or mechanical sensation with rotation. The point of maximal tenderness is the fovea. Stressing the distal radioulnar joint by placing the wrist in dorsiflexion and sequentially tightening the dorsal deep fibres by supinating, the volar deep fibres by pronating and stressing the joint by shifting the radius and ulna relative to each other will reproduce the pain of an unstable distal radioulnar joint from injury to the radioulnar ligaments. X-rays are typically negative. 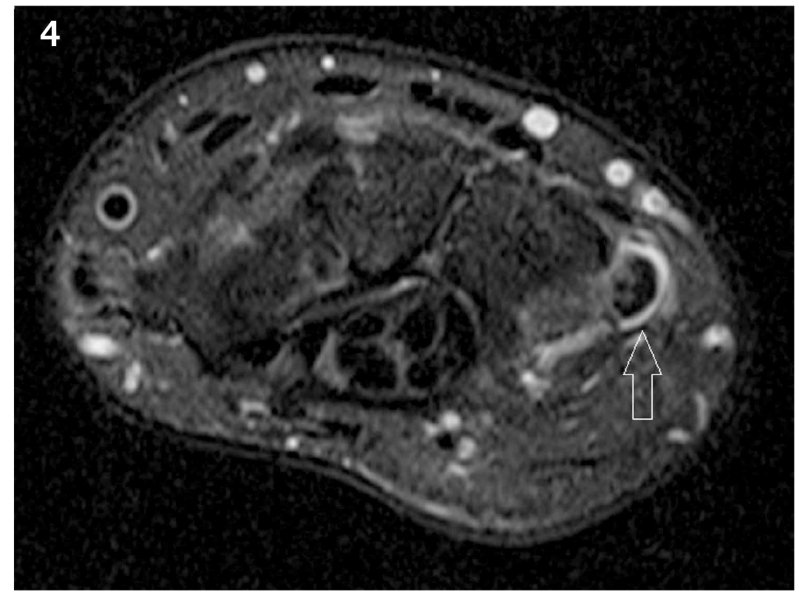 MRI has a high sensitivity and specificity for radial-sided tears of the TFC but a low sensitivity and specificity for tears of the TFC from the ECU sub-sheath or the distal ulna on the ulnar (medial) attachment. It is important to recognise this because often perforations in the TFC seen on MRI are asymptomatic and may be incidental, whereas the pathology that corresponds to the history and physical examination may not be appreciated. Arthroscopic evaluation of the wrist provides the most definitive diagnosis. Most tennis players will be symptomatic due to the tear from the sub-sheath, so this area must be evaluated by imaging and/or arthroscopy. Initial management of an acute TFC tear may include long arm immobilisation. Preventing rotation for 2 months may allow the injured structure to heal and the athlete to return to play. If this is not successful, arthroscopic examination can provide the definitive diagnosis and both open and arthroscopic techniques have been described for repair10. Repair of the tear from the sub-sheath must be done to stabilise the TFC to allow it to function normally. An uncommon fracture that can occur in tennis players, along with baseball players and golfers, is the fracture of the hook of the hamate. The hamate is the carpal bone just beneath the ring and little finger metacarpals. It has a projection on its distal aspect that provides attachment to the transverse carpal ligament in the palm. This projection is called the hook, which is the most prominent bony structure in contact with the racquet. With impact (or a fall on the ground) the excessive force on the hamate coupled with traction from the transverse carpal ligament may cause a fracture. 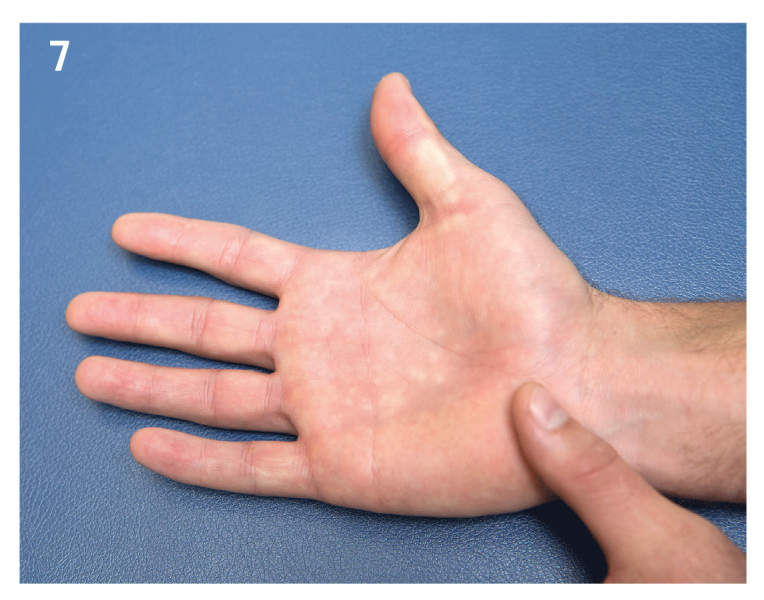 Sudden onset of pain in the palm of the hand, radiating to the ulnar aspect of the wrist after a forehand (dominant hand) or backhand (non-dominant hand) or a fall on the outstretched hand. This pain may be difficult to localise. Point tenderness in the palmar projection of the hook of the hamate is highly suspicious for fracture (Figure 7). Plain radiographs using a specialised view known as the carpal tunnel view can illustrate the diagnosis. Confirmation by CT scan or MRI can also be performed (Figure 8). Small avulsion fractures can be treated by immobilisation. Internal fixation (sometimes excision) of the hook of the hamate is typically performed for displaced or large fragments. The proximity of the flexor tendons to the ring and little fingers to the fracture puts them at risk of attritional rupture from the rough edges of bone in untreated cases. Wrist injuries in tennis players are common. Knowledge of grip technique and a differential of common diagnoses in tennis players can help predict injury patterns. Experience in physical examination and a consistent method of examining the wrist enhances diagnostic capabilities. Early diagnosis of these injuries is important in athletes. Once a diagnosis is made, prognosis and treatment options can be determined. Although MRI and ultrasound can often diagnose these injuries, the history and physical can also be quite precise. Tagliafico AS, Ameri P, Michaud J, Derchi LE, Sormani MP, Martinoli C. Wrist injuries in tennis players: Relationships with different grips. 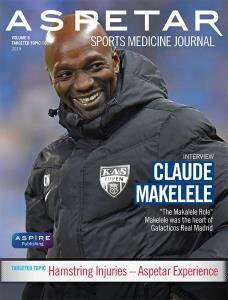 Am J Sports Med 2009; 37:760-767. Kleinman WB. Examination of the wrist [DVD] Am Soc Surg Hand. Yin ZG, Zhang JB, Kan SL, Wang XG. Diagnosing suspected scaphoid fractures: a systematic review and metanalysis. Clin Orthop Relat Res. 2010; 468: 723-734. Dias JJ, Wildin CJ, Bhowal B, Thompson JR. Should acute scaphoid fractures be fixed? A randomized controlled trial. J Bone Joint Surg Am 2005; 87:2160-2168. McQueen MM, Gelbke MK, Wakefield A, Will EM, Gaebler C. Percutaneous screw fixation versus conservative treatment for fractures of the waist of the scaphoid: a prospective randomised study. J Bone Joint Surg Br 2008; 90:66-71. Kang L, Weiss AP, Akelman E. Arthroscopic vs open dorsal ganglion cyst excision. Op Tech Orthop 2012; 22:131-135. Montalvan B, Parier J, Brasseur JL, Le Viet D, Drape JL. Extensor carpi ulnaris injuries in tennis players: a study of 28 cases. Br J Sports Med 2006; 40:424-429. MacLennan AJ, Nemechek NM, Waitayawinyu T, Trumble TE. Diagnosis and anatomic reconstruction of extensor carpi ulnaris subluxation. J Hand Surg Am 2008; 33:59-64. Burkhart SS, Wood MB, Linsheid RL. Posttraumatic recurrent subluxation of the extensor carpi ulnaris tendon. J Hand Surg Am 1982; 7:1-3. Kovachevich R, Elhassan BT. Arthroscopic and Open Repair of the TFCC. Hand Clinics 2010; 26:485-494.